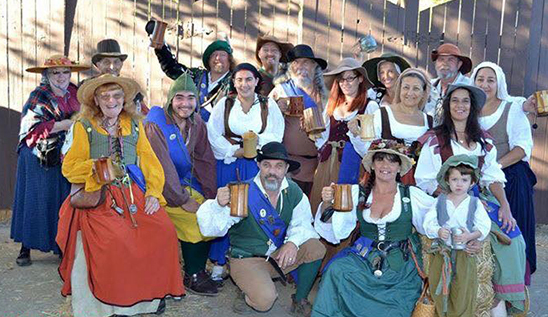 The Northern California Renaissance Faire is always in need of energetic volunteers. The Volunteer Regent Program offers an alternative way to participate at faire other than working in Marketplace or joining a guild. It is a great way for new participants to learn more about the organization and the options at faire. Volunteers may earn a pass through a variety of services that aid and enhance the faire. Volunteers go through the same pre-faire training and workshops and follow the same costume guidelines as other participants. We have many volunteer positions available from handing out programs, ticket taking, Meet & Greet and more. Potential volunteers should read the Participate in Entertainment page for more information on the Registration process. Please email the Volunteer Coordinator with any questions you may have at volunteer@norcalrenfaire.com. Thank you again for your interest. Northern California Friends of Faire (FOF) is an independent membership organization that works closely with the Northern California Renaissance Faire. Members make up the majority of the volunteers that help service the faire. FOF provides a fun, family like environment for new participants and visitors to faire and welcomes them into their membership garden area.